The Day After The Sabbath: 2nd birthday and Merry Christmas! 2nd birthday and Merry Christmas! The blog has been going for two years now, much longer than I expected, and has become something of a 'second job' for me so I just would like to say thanks to everyone who has contributed, and also to all those who have been listening, shown interest and kept me doing it! If any of you have comments, ideas for new themes or would just like to show me some more great bands drop me a line on Facebook, LastFM, aftersabbath@live.co.uk or here on the blog. 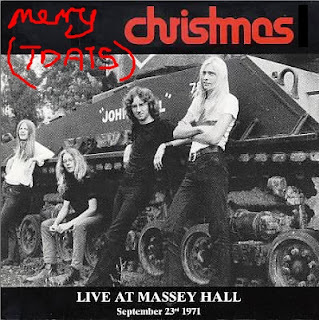 In the mean-time, have an awesome Christmas and new year, and watch out for the next volume which will be another bunch of great Canadian bands entitled "All Thy Sons Command!" Happy second blog anniversary and Merry X-Mas, Rich! Thanks for all the kickass tunes! thanks man the same to you.. long live the day after the sabbath blogspot and those forgotten and heavy bands!